Most businesses look for systems to manage organization and have landed on the idea of utilizing NetSuite for the purpose. NetSuite has attained the reputation of one of the fastest growing cloud-based Enterprise Resource Planning (ERP) system. As ERP software, it helps companies handle their accounting, customer relationship management (CRM), Inventory, Warehouse Management, Human Resource Management and Payroll, service resource planning, procurement, and many more functions to help run businesses. Benefits of NetSuite are many. To begin with, it is suitable for companies that want to centralize their data via a fully integrated source and minimize all inaccuracies and inefficiencies that happen due to manual data management. For many, NetSuite is the one-stop all-in-one control center for management of all business operations. For all the business owners or financial executives grappling with the world of NetSuite- hiring a Netsuite Consultant can offer you multiple benefits. Read on to know more. The options that are available to business managers are plenty, but due to constant upgrades in technology, managers find it difficult to stay updated with systems like NetSuite. This is when businesses need to realise that they could make use of a helping hand-a private NetSuite Consultant. If your business involves different teams using different software to run operations, then it’s time to shift to NetSuite. A NetSuite consultant would help you utilize NetSuite in such a way that it singularizes the verticals of the firm. With just a simple step, you will be able to manage the duality and complex web of systems in the inter-team management. Dependence on manual data entry is one of the biggest sources of inaccuracies in data management. When a business relies on such a method, it risks missing out on crucial business intelligence for assimilation of data. NetSuite Consultants help you decrypt all the dry data you have and contribute to the business intelligence that you really need. Customer Relationship Management is extremely crucial for businesses as is maintaining a steady strategy on sales. Both activities are time consuming and prone to shortcomings when businesses try to use ERP systems on their own without any expertise. 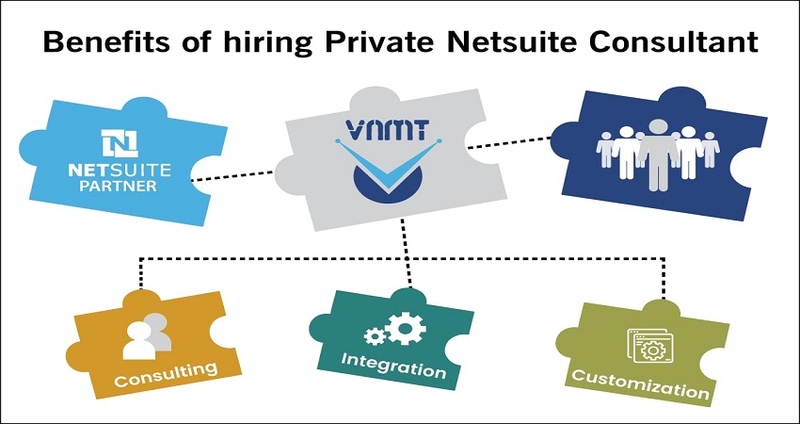 Once you hire a private consultant for NetSuite, you will realize how easy and seamless the processes of integrating customer relationship activities like marketing, sales force, customer support and service is. Not just this, maintaining a constant data pipeline for sales forecasts to strategize better on sales will also be much easier and efficient when your NetSuite consultant helps you out. Even though your business might have gotten hold of NetSuite, you will be faced with the challenge of constant upgrades of the software that you as a manager will be unaware of on most occasions. This tends to make your ERP systems outdated quickly. NetSuite Consultants help you move your ERP to the cloud like on NetSuite and reduce your expenses on IT. Consultants of NetSuite are the experts that you need in order to eliminate any system inconsistencies that your company might be facing. You find yourself struggling to keep your ERP system updated and are tired of applying patches every now and then. Naturally, moving on to NetSuite by hiring the right consultant will take away all pressing concerns about updates and patches. While hiring a NetSuite consultant, you may take into consideration their experience in your industry, the duration of their work in your system, any training that they might offer to help you transition into cloud-based ERP, or even asking the potential consultant if they can offer SuiteScript customization. But the foremost concern for your business intelligence system is the gaps in it and your solution lies in hiring a professional NetSuite consultant that works closely with your business processes and requirements.